Bike Hugger is still taking in the sights at TrekWorld, the annual gathering for the unveiling of the Trek lineup to dealers and to media insiders. Byron’s been on the ground there for days, and he’s rounded up product managers and product and wanted to share some thoughts about the event. (Of course he’s too darned busy shooting iPhone video to YouTube like this quick hello from product designers to write, but will be reporting back when he’s recovered from the wild partying that Madison Wisconsin is known for). Byron’s noting that the city itself is great–small town Americana combined with the big business of Trek. And speaking of Americana, both Trek and SRAM seem to be the biggest players when it comes to bike advocacy–something near and dear to our hearts here. 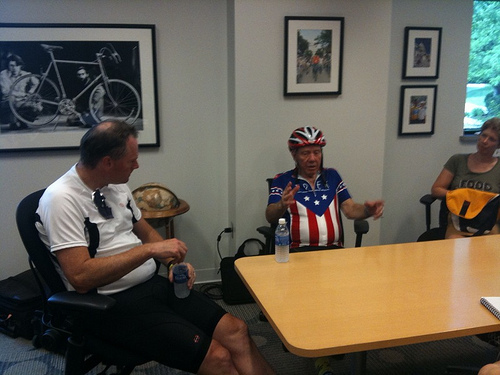 Trek’s president John Burke has lead the charge for change with millions given to advocacy (that explains the lead-off photo of congressman James Oberstar and John Burke having a meeting) and SRAM has committed $10M, despite the seeming lack of enthusiasm from the rest of the industry. The group of assembled journalists got to watch a Madone being built–the process is all done by hand (and machine obviously but no big ol’ robots here) and it’s an amazing job. We’re suggesting they show off their bikes at the North American Handmade Bicycle Show. Trek’s been showing off the new Super Fly which is gorgeous and we’ll be talking about that shortly.